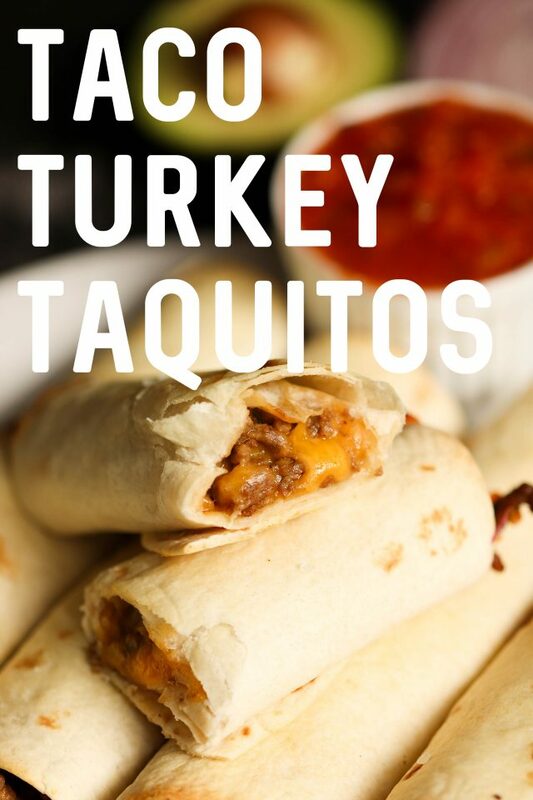 The perfect dinner for busy nights, these turkey taco taquitos are ready in just 30 minutes. Packed full of ground turkey and cheese, then baked to perfection, they are a favorite for kids and adults. When you’re crunched for time and just trying to get dinner on the table, this is the perfect main dish. Stuffed with ground turkey, cheese, and then baked to a crispy finish – everyone loves them! 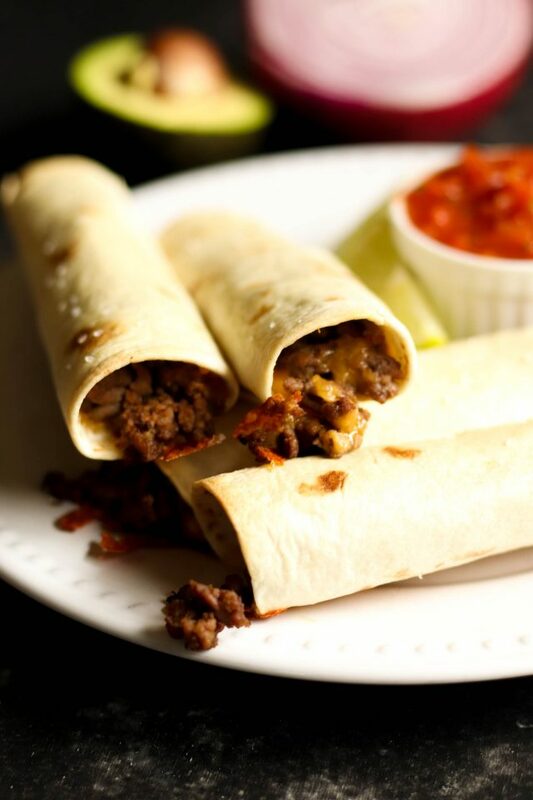 These oven baked taquitos are a healthy non-fried alternative to your favorite dish. The trick to getting these taquitos perfectly crispy is to brush them with olive oil before they go in the oven. The oil caramelizes giving these a crispy crunch with every bite. Step 2: Cover a large baking sheet with aluminum foil and spray lightly with cooking spray. 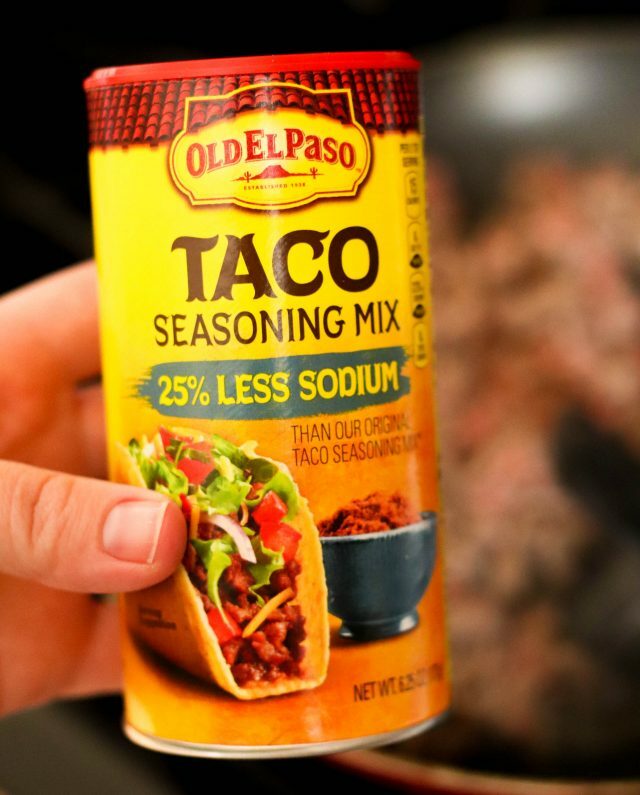 This is our favorite store-bought taco seasoning (we just buy it in bulk). If you don’t like store bought seasoning, you can always make your own. Step 3: In a large skillet, heat oil over medium heat, then add onion and garlic. Saute for about 5 minutes until soft. Add turkey and taco seasoning, cooking until meat is browned. Mix well and let cook for a couple of minutes so that the flavors can meld and the mixture can thicken. Step 4: Spoon 2-3 tablespoons of the taco meat mixture into a tortilla, topped with a pinch of shredded cheese and roll it up. Place taquito seam-side down on the baking sheet. Repeat about 20 times (I had to use two baking sheets because all of my taquitos would not fit on one). Step 5: Once finished, brush the tops of the taquitos with olive oil and sprinkle with salt. Step 6: Place pan in oven and bake for 15-20 minutes (or until edges and tops are golden). Let cool for a couple of minutes. Serve with salsa or your favorite taco toppings. If you’re making these for just a few people, or if you’re looking to get dinner done ahead of time, you can easily turn this recipe into a freezer meal. To do so, prepare the recipe as directed. After rolling the taquitos, place them in a gallon sized freezer bag. You should be able to fit all of them in one bag (keeping the bag full will keep the taquitos rolled up). 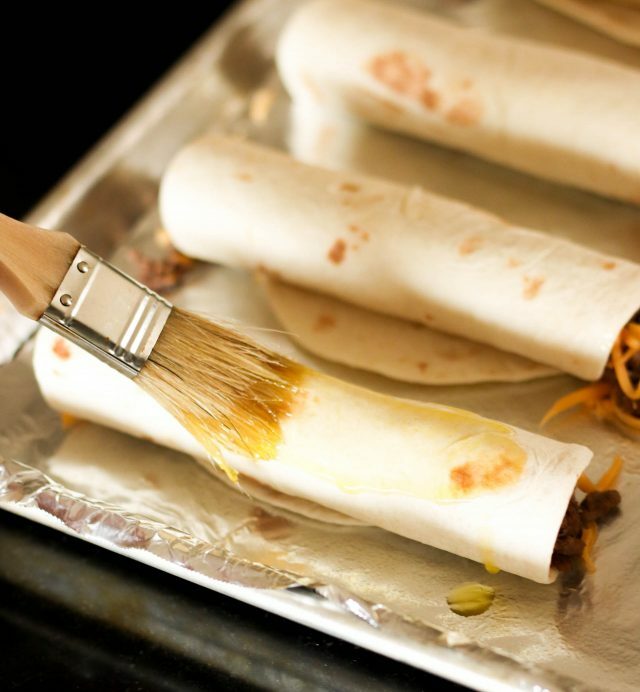 When ready to bake, remove taquitos from the freezer and let them thaw in the fridge for 12 hours. Place taquitos seam-side down on the baking sheet. Brush the tops of the taquitos with olive oil and sprinkle with salt. Bake at 425 degrees for 15 minutes or until the tops begin to golden. Let them cool slightly and serve with ranch or salsa. Oven Mitts <— These ones are our favorite, and on sale! Baking Sheet <— This baking sheet is large enough to fit ALL the taquitos in this recipe. Freezer Bags <— If you’re wanting to make this into a freezer meal, you’ll need the freezer bags! In a large skillet, heat oil over medium heat, then add onion and garlic. Saute for about 5 minutes until soft. Add turkey and taco seasoning, cooking until meat is browned. Mix well and let cook for a couple of minutes so that the flavors can meld and the mixture can thicken. 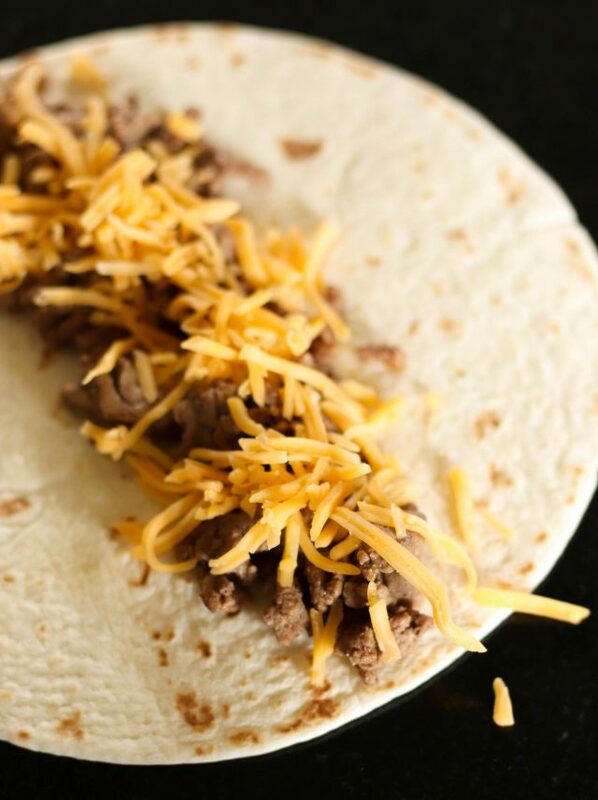 Spoon 2-3 tablespoons of the taco meat mixture into a tortilla, topped with a pinch of shredded cheese and roll it up. Place taquito seam-side down on the baking sheet. Repeat about 20 times (I had to use two baking sheets because all of my taquitos would not fit on one). Once finished, brush the tops of the taquitos with olive oil and sprinkle with salt. Place pan in oven and bake for 15-20 minutes (or until edges and tops are golden). Let cool for a couple of minutes. Serve with salsa or your favorite taco toppings. The ingredients didn't list beans or salsa. Can you post the amounts? Thank you. I'm so sorry - There are no beans or salsa in the recipe - you can use refried beans and salsa to dip them into after they are cooked! Do you think that this recipe could be frozen? Hi Sarah. These can definitely be frozen. Freeze them in inividual freezer bags or foil. Then microwave them on a plate. Thawing is not needed when reheating. I know this post is older but... A little paste of flour and water brushed on the edge of the tortilla that will be the seam on the outside will keep them rolled tightly whether baking immediately or freezing. Either way, let them rest 10 min while the paste dries a bit and they should stay nice and secure!